Delaware timber harvests achieved a 93 percent rate of compliance with best management practices (BMPs) designed to protect water quality and limit soil erosion, according to a new report. 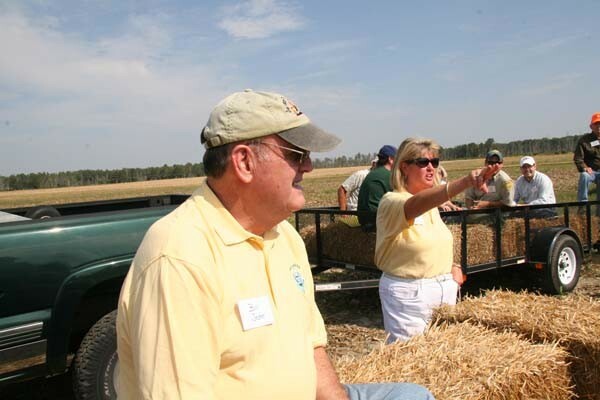 Recommended practices included: pre-harvest planning to properly locate access roads, avoiding stream crossings and wetlands, curtailing harvests during wet periods, and maintaining sufficient forest buffers near water. Dr. Anne Hairston-Strang, a forest hydrologist with the Maryland DNR Forest Service, sought to assess the use and effectiveness of BMPs by surveying a total of 72 sites in Maryland and Delaware from 2014 to 2016 (Figure 1). Selected sites were locations with waterway crossings and buffers with the greatest potential for water quality impacts. Effects were expected to be larger than normal because high rainfall during the 2014-2016 period represented an increase of 20 percent above the 30-year average. 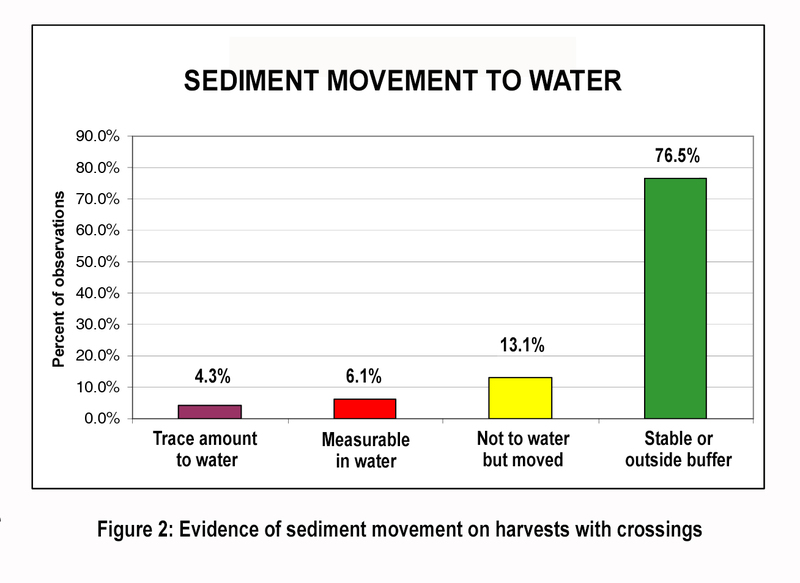 However, final data indicated that the average sediment delivery across all locations was less than one cubic foot per site—indicating that proper use of BMPs was successful at protecting water quality during harvest operations. The results are also important because a substantial part of western Delaware is located in the Chesapeake Bay Watershed, the largest estuary in the United States and a critical natural resource area targeted for public and private restoration efforts. The report also offers evidence that Delaware’s relatively flat coastal plain topography can help to make the application of BMPs even more effective at preventing sediment deposits in waterways. Other key study findings are summarized below. 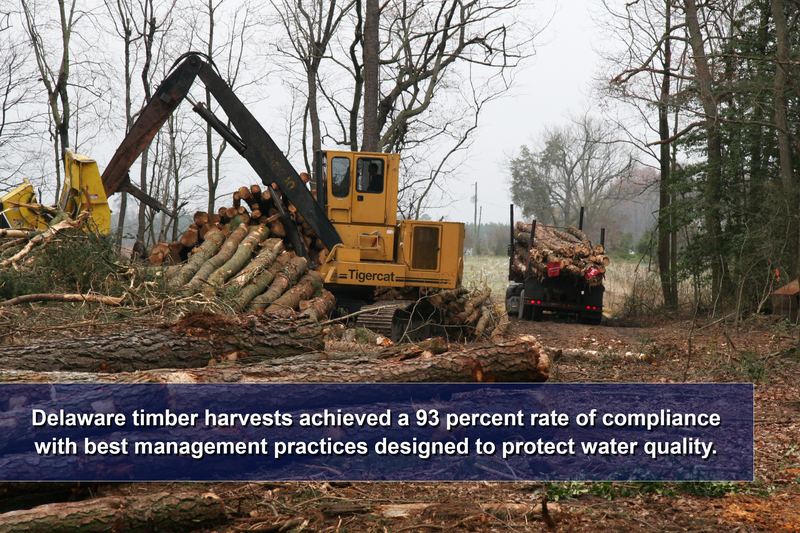 Forests are one of the best land uses for achieving high water quality. Trees act as natural filters to mitigate erosion, remove pollutants, reduce storm water flow, and lower water treatment costs. Forests are also sustainable sources of valuable wood products and good jobs. As part of a comprehensive forest stewardship plan, activities such as pre-commercial thinning can keep forests healthy from overstocking and forest pest issues. Similarly, properly planned and well-managed harvests of “working forests” can help landowners capture economic benefits while also meeting important resource objectives such as water quality, wildlife, and recreation. 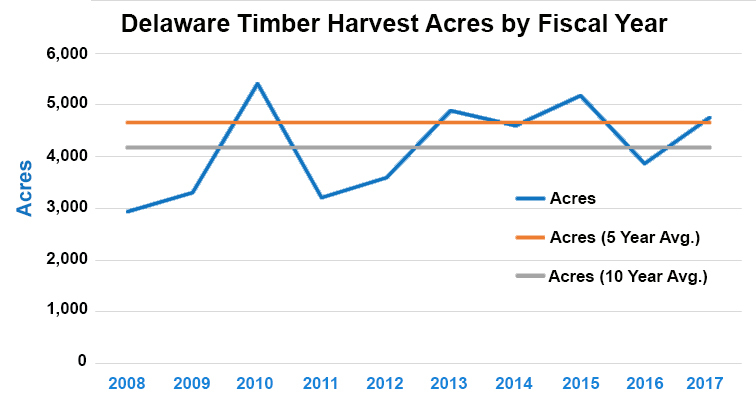 Timber income can help owners keep their land as forestland, preventing its conversion to more developed land uses that contain greater impervious surface area with the potential risk of a corresponding decline in water quality. 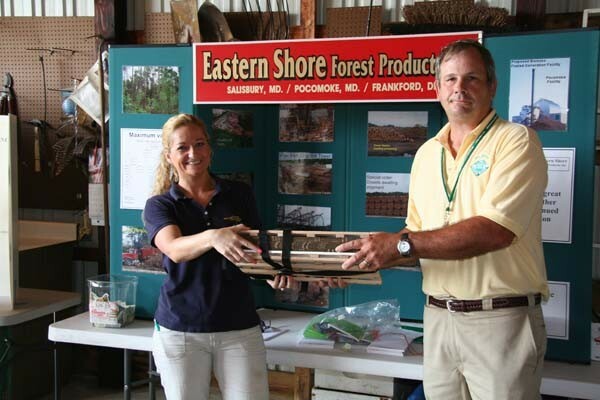 As part of its core programs, the Delaware Forest Service offers free management planning to forest landowners, including cost-share-assistance for activities such as reforestation as well as property tax exemptions. Forest operations in the First State are subject to the Forest Practices Erosion and Sedimentation Law (Title 3, Chapter 10, Subchapter VI) that was signed by Governor Thomas Carper in July, 1994. 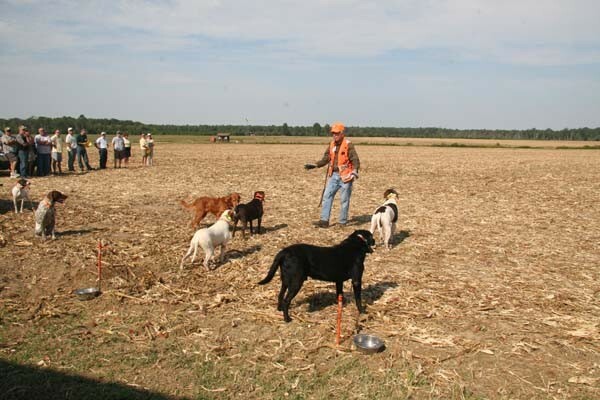 In Delaware, an E&S permit – accompanied by a site map – is required for all harvests greater than one acre in size not subject to a land use conversion. 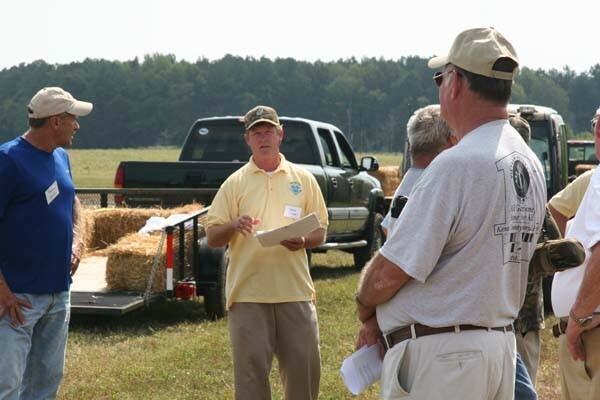 In addition, Delaware’s “Seed Tree Law” requires owners of harvest sites that contains at least 25 percent of yellow-poplar or loblolly pine – two of Delaware’s most important commercial species – to provide for adequate reforestation of the area. Buffers along riparian areas are particularly important, however the buffer requirement need not be overly restrictive to commercial operators: harvesting can occur within the buffer zone but a minimum of 60 square feet of basal area must be left—usually over half of the trees in an area. On sites with water crossings, 90 percent avoided delivering sediment to waterways, while 6 percent delivered measurable amounts of sediment at crossings or approaches (Figure 2). The average volume of delivered sediment was estimated at 14 cubic feet. Sites with crossings averaged 4 cubic feet per site. Buffers around waterways were an important best management practice. Sediment had moved into buffers in 12 percent of observations. On average, sediment moved 45 percent of the way through the buffer, then deposited before reaching water. In Delaware, the greatest distance moved was 60 percent of buffer width, while Maryland had a location where sediment reached the water through the buffer around crossings. On two of the 72 sites, log landings were in the buffer area (3 percent). These were in Delaware, where many sites are on old fields next to ditches and may have been using an existing cleared area. No sediment breached buffers in Delaware, aided by the gentle slopes in the coastal plain. Most buffers provided good shade, averaging 86 percent canopy in Delaware. Most buffers, 87 percent, met state requirements, or buffers were not required on the types of waterways assessed (Maryland met on 84 percent, Delaware 100 percent). The largest trees on the assessed buffer plots after the harvest averaged 20 inches in diameter. 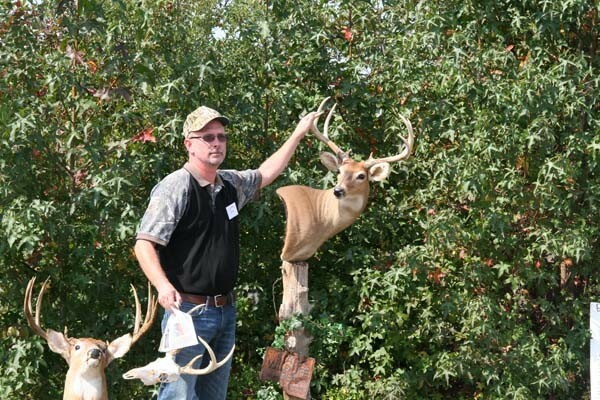 Basal area was generally high, 98 square feet per acre, typical of a fully stocked forest stand. 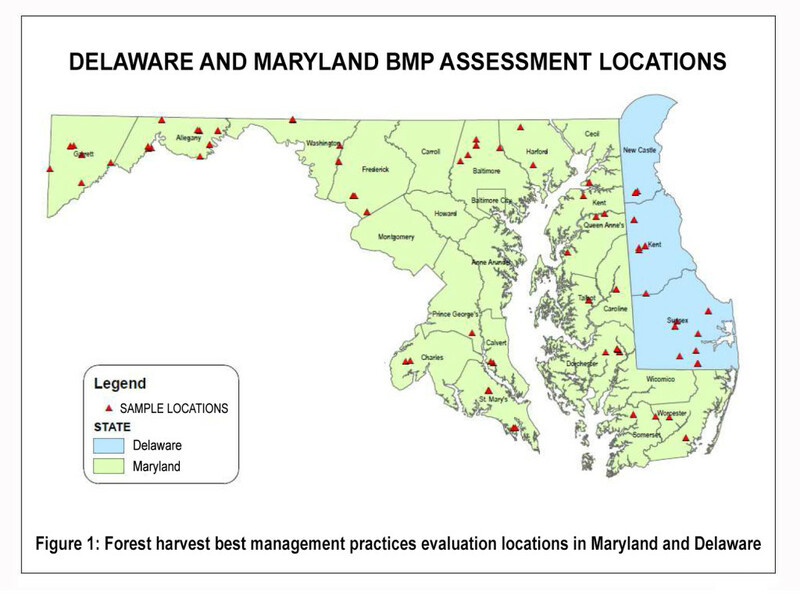 Delaware’s Forestry BMP Manual was developed by the Delaware Forest Service in cooperation with numerous public, private, and nonprofit stakeholders: the Delaware Forestry Association, Delaware Tree Farm Committee, Society of American Foresters, Delaware Farm Bureau, Delaware Nature Society, and Delaware chapters of the Audubon Society and Sierra Club. 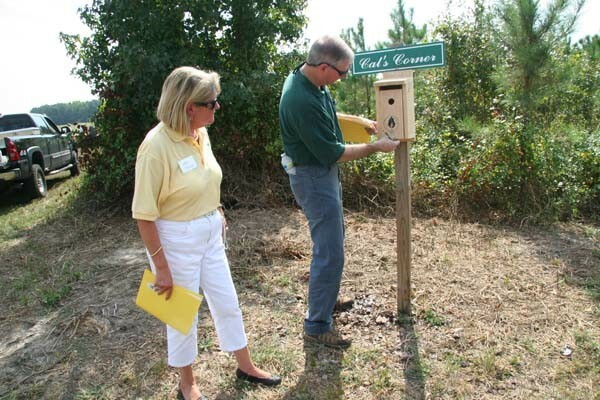 Also contributing to the guidelines were the Delaware Association of Conservation Districts and Delaware’s Department of Natural Resources and Environmental Control: Division of Water Resources Wetlands and Subaqueous Lands Section; Division of Soil and Water Conservation; Non-Point Source Pollution Program; Coastal Zone Management Program; Drainage Program; Sediment and Stormwater Management Program; and the Division of Fish and Wildlife. 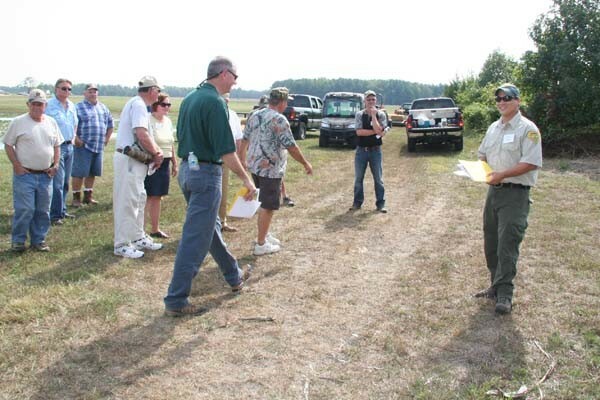 Federal partners included the U.S. Forest Service’s Northeastern Area State and Private Forestry Program and the U.S. Environmental Protection Agency, Non-Point Source Pollution Program.